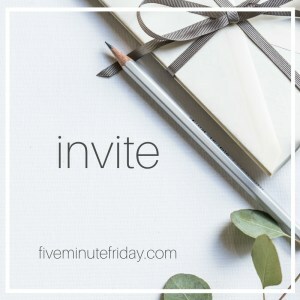 This week's Five Minute Friday post on invite stirred my heart. I have been thoughtfully asking God for a specific thing for a long time. What's that? Friendship. Community. Yep, I know. For those of you who know me, that may seem like an odd request. Honestly, as I get older, I find myself yearning for something that I do not have (outside of my husband), a best friend. Don't misunderstand...I have good friends, and I have framily (friends who are like family). However, I don't have a person - one that I can call in the middle of the night, one that knows all my dirt and drama and loves me anyway, one that will literally pray me back from the edge when I am ready to jump. Now, I may be asking too much of one person (lol), as I do have several people that embody these qualities for me (thank you, I love you). Additionally, I have been desiring a local gathering of women to lean in with, to worship and pray with, to connect with in discipleship and spiritual growth. I was intentional about bending God's ear on these matters. A few months ago, I was a part of a book launch team for a great book, She's Still There by Chrystal Evans Hurst. As we all dove into the particulars of healing and rescuing the girl in us, one of the most common themes was a desire for friendship. A community that provided a soft spot to land for the weary heart. It was suggested that if you don't have community/friendship, that you start your own. That stuck with me. So much so, that I could not shake the nagging feeling that I needed to offer to others what I had so desperately been praying to God about for myself. As a result, I have been inviting women through questions and conversation to dig deep about what their barriers are to having community and friendship. I wanted to invite them to let their hair down, sit with someone, heal, find respite and rest through the fellowship of community. I didn't know what exactly it would/should look like, and I still don't have any other instructions yet, but I am inviting the hearts and hands of women to consider what life would look like for them through the lens of community.